Ultiworld is pleased to announced our fifth annual College Awards. The criteria for each award can be found here — we consider both regular season and postseason performance in our selection of awards. Though the input of Ultiworld reporters is weighed heavily, final decisions for awards are made by the editors. The Player of the Year Award, and its Runners-up, represent the best overall performers of the 2018 season. These three individuals were the most impactful players in the division this spring. Normile’s case for POTY is simple: no other player in the college women’s division was more lethal with the disc in hand. No mark was able to completely contain her throws or keep her from getting the disc at will. For every facet of her game that her marks tried to take away, Normile would find five other ways to expose them and keep Pitt’s offense flowing smoothly. It’s not as if zones or junk defenses were that much more effective, either. Through the course of 2018, Normile has shown that she’s more than just an exemplary handler; she may genuinely have the Midas touch. Pittsburgh’s star player was given a huge amount of responsibility at the beginning of the season, and proceeded to exceed every expectation placed on her. Even during games where Pitt seemed outmatched, Normile would will her team into crucial holds and return to the line immediately to hunt for breaks. It wasn’t just that she was asked to play almost every point for Danger, but that Normile was also their most aggressive player at any position. While her throwing prowess is well documented, Normile was equally effective as an initiating cutter and downfield threat. Even with her reputation, opposing defenses struggled to find players capable of guarding Normile and her relentless energy. With lightning-quick reflexes and an unbeatable first-step while cutting, Normile wasn’t unguardable so much as she was indomitable. While her performance at Nationals would seem incredible for most players, it’s almost commonplace for Normile now. After a historic run with AMP at Nationals in October 2017, and an even more impressive performance for Team USA in Perth this summer, Normile has set a precedent for racking up accolades when the stakes at at their highest. Where some would wither under the weight of the expectations, Normile always seems to thrive. Her stats back that up, too. Normile led Pitt in goals and assists, and placed second in blocks. 16 goals, 27 assists, and 13 blocks are impressive numbers, but do a poor job in explaining how dangerous Normile was every time she stepped on the field. It was her composure and determination that helped Pitt come from behind twice during pool play and beat two of the top six ranked teams in the nation to win their pool. She was also instrumental in Pitt’s statement win over Oregon, which may have been the game of the tournament. Adding Normile to an offense is the equivalent of stacking your deck. Your opponent might have a good hand of cards, but you’re the one sitting with a pair of aces. If Normile continues on this trajectory, there’s no telling what she could accomplish. But for now, she’s earned her spot as the 2018 Player of the Year. If Wei had missed the entire regular season, and only had her performance at Nationals as a resume, she might still have been a lock for this list based on her performance in Milwaukee. Wei lead the division in blocks (24), tied for third in goals (18), and was +36 for the tournament overall. Her stat line underlines a fact that most people already knew: Wei is one of the best two-way players in the division. North Carolina is a deep team, but their offense and defense still orbit around Wei when she’s on the field, and she’s a crucial piece of their ascendancy to a no. 3 spot in the regular season. Verzuh didn’t have the statistical performance at Nationals that was expected of her. In fact, she finished tied for third on her own team in combined assists, goals, and blocks. But Verzuh’s impact on the field was so much deeper than her statistical output. She brought such gravity to the field that she created a black hole of defensive attention, freeing up her teammates to pass, catch, assist, and score at will. When she did touch the disc, she demonstrated the skill and consistency that make her such a star. Verzuh was still the most important player to take the field in the division this season. For some, that may mean she should have won this award outright. What Normile and Wei did for teams with less talent around them are what gave them the edge of Verzuh this year, but Dartmouth’s star was still the indomitable, unsolvable force everyone expected her to be in 2018. 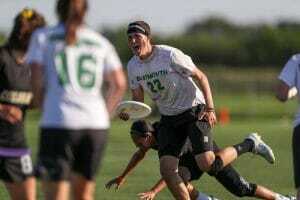 Comments on "D-I Women’s 2018 Player of the Year, Presented by VC Ultimate & NUTC"